IMPORTANT NOTE: During Certificate Verification the candidates Aadhaar details (Finger Print Biometric) shall be verified with UIDAI (Unique Identification Authority of India) at the Help Line Centers. Therefore it is mandatory for the candidate to attend for Certificate Verification. a. PH-Certificate issued by District Medical Board. Candidates with 40% and above disability are only eligible. b. CAP- Certificate issued by Zilla Sainik Welfare Board (In case of Ex-Service men) Identity card and Discharge book for verification. Candidates whose parents are domicile of Andhra Pradesh (for AP Eamcet Candiates), domicile of Telangana (TS Eamcet Candiates) are only eligible to be considered under "CAP" Category. d. Minorities: SSC TC containing Minority status or Certificate from the Head Master. e. Anglo-Indian: A Certificate issued by Tahsildar of their place of Residence. The Qualified Candidates of TSEAMCET-2018 (M.P.C STREAM) who have not attended for Certificate Verification earlier shall get their Certificates verified from designated Help Line Centres mentioned in the Annexure I. The candidates who have participated in Phase-I Counseling can also exercise options using their old password, Login ID, for the leftover seats now available and consequential vacancies that may arise in the process of allotment as per the schedule given below, and it is advised to exercise options for interested Engineering and Pharmacy (including Pharm D) Colleges assuming that vacancies are available in the course of their choice. LAST ++ Means: Minority Candidates including Not Qualified/Not Appeared in TSEAMCET -2018 who have already applied to Convenor based on Intermediate or its equivalent marks. Who can exercise options ? Options given in the phase 1 will not be considered for allotment and candidates have to exercise options afresh. Candidates shall note that if they exercise options now and a seat is allotted as per the options exercised a fresh. The vacated seat will be allotted to next meritorious candidate and hence they will have no claim on previous allotment which was vacated. The special category candidates (sports/ ncc/ cap/ ph/ anglo-indian) who did not get their certificates verified earlier should get their certificates verified now at sankethika vidya bhavan, masab tank, hyderabad only. ST Candidates shall attend for certificate verification in the help line centers marked with **. Income Certificate issued after 01-01-2018by competent authority, if applicable. Caste Certificate issued by competent authority, if applicable. Physically Challenged (PH)/Children of Armed Forces Personnel (CAP)/ National Cadet Corps (NCC)/Sports and Games/ Minority certificate, if applicable. Residence certificate of candidate for a period of 7 years preceding to qualifying examination in case where the candidate has no institutionalized. CAP: Certificate issued by Zilla Sainik Welfare Officer, Identity card, and Discharge book (In case of Ex-Service men) and Service Certificate (in case of in Service Men) issued by Competent Authority for verification. Candidates whose parents are domiciled in the State of Telangana based on the Permanent Address/Home Town declared by them while joining the service and as recorded in their Service Register are alone eligible to be considered under CAP Category. NCC & Sports: Certificates issued by competent authorities. Candidates are informed that the Pharmacy Council of India vide Ref. No: 14-2/2015-PCI (A)-17504-19512, dt: 30/07/2015 has approved 10+2 from N.O.S (National Open School) for admission into Pharmacy courses for the Purpose of Registration as pharmacist. The candidates who secured 45% (For OC) and 40% (SC/ST/BC) in group subjects of Intermediate or its equivalent examination are only eligible for admission as prescribed by AICTE/Government. Payment will be at the Time of Certificate Verification. Tuition Fee particulars and seats available under Convener Quota College wise Will be made available on the website https://tseamcet.nic.in well before the commencement of Option Entry. The fee reimbursement for eligible candidates is subject to the guidelines issued by the Government from time to time. Eligible Candidates of AP EAMCET-2018 (M.P.C. Stream) are informed to exercise the options using their old password and Login ID.No. for the leftover seats now available and consequential vacancies that may arise in process of allotment, additional seats and seats available in new colleges/courses, if any from any Help Line Centre or Internet facility (Cafe/Home) as per the schedule given below. The Candidates Who have not attended for Certificate verification during first phase should get their certificates verified as per the schedule from any Help Line Center and exercise options on the same day as per the Ranks mentioned below. All Help Line Centres will work from 09.00 AM to 06.00 PM. For list of Help Line centers see the Annexure-I. Who have not secured seats so far, but got their certificates verified. Options given in the 1st Phase will not be considered for this Phase of admissions for allotment of a seat and candidates have to exercise options afresh. Candidates who are satisfied with their previous allotment need not exercise option once again. They shall note that if they exercise options now and a seat is allotted as per the options, the vacated seat will be allotted to next meritorious candidate and hence they will have no claim on the previous allotment. NCC & SPORTS categories seats will be allotted in this phase as per merit list submitted by the respective authorities. NOTE: candidates who will attend certificate verification first time have to pay processing fee online before he/she attends certificate verification. Processing Fee: Rs.1200/- (OC/BC), Rs.600/-(SC/ST). Processing fee can be paid online by the candidate using credit card or debit card or through net banking from 19.07.2018. Visit https://apeamcet.nic.in and click on processing fee payment online. 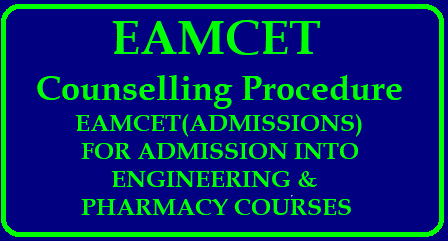 Enter APEAMCET Hall Ticket number and rank and click on pay fee online. Candidate shall note that he/she shall have paid the processing fee when candidate attends for certificate verification as per the schedule and ranks mentioned against each date. i.e the processing fee should be paid online by the candidate before he/she attends certificate verification. Note: . For downloading the candidates allotment order, enter the ROC Form Number, Hall Ticket Number, Password and Date of Birth in Candidate login in https://tseamcet.nic.in by Telangana Eamcet Aspirants and https://apeamcet.nic.in by AndhraPradesh Eamcet Aspirants.